Place a Kadai on the stove,add oil for seasoning.Then add Lal mirchi,Mustard ,Methi,Greenchilli slits and asafotida and curry leaves,one by one,contnuosly stirring.After it splutters,keep the stove in low flame,and also add Besan powder.Continuosly stir the mixture in a low flame, till the Besan turns in to light brown. (The flame should be low or else the besan will be over fried and turns dark brown in colour.The whole chutney becomes bitter if we use such besan powder.) Then switch it off. 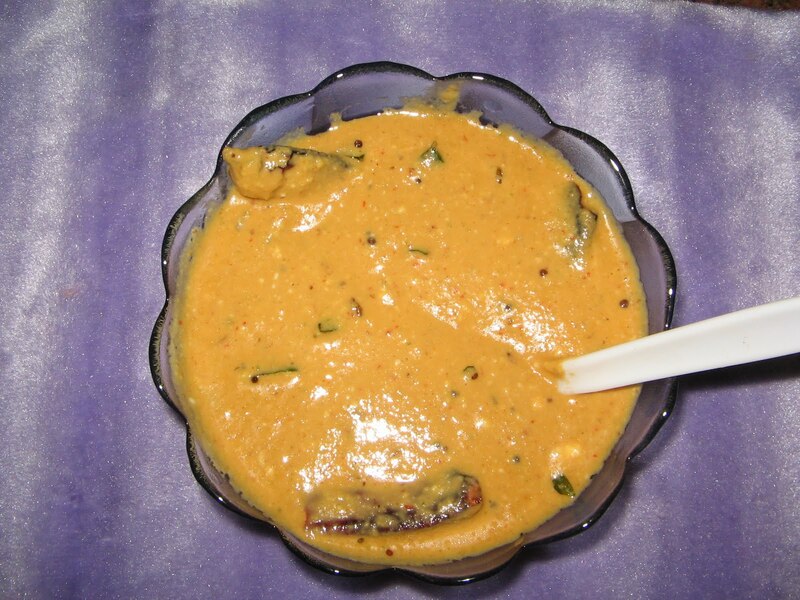 Take Besan into a seperate bowl,add tamarind water,and mix it well without any lumps.Then Salt is added as it is required. The consistancy of the Besan chutney will be semi solid,if the chutney is needed slightly more watery then another half cup of Tamarind juice can be added.Garnish with some more Seasoning and Curry leaves.